An apartment ideal for 4 people located on the seventh floor of the Ondar Gain building in Mendilauta, about 100 metres from the beach & close to the restaurant Arguinano. 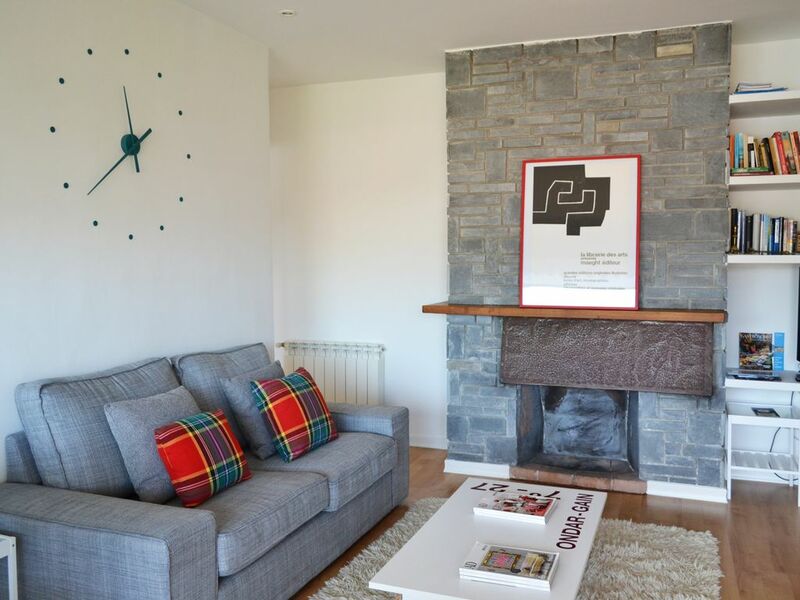 Guests can enjoy spectacular views of the sea, nearby Getaria and the mountains to the south of Zarautz. The apartment features two bedrooms, one with a twin nest bed and the other main bedroom with two individual beds. Both bedrooms are bright and provide the same excellent views. The apartment also features an American-style kitchen together with a living room and dining área in an open plan arrangement. Finally there is a bathroom with shower plus a balcony perfect for meals and suitable for use in Summer or Winter due to its ingenious folding glass window system. An underground parking space is also included together with a secure storage área, both accesible by lift in the same building as the apartment. The Ondar Gain complex benefits from an attractive comunal garden with children’s play área and a basketball court. My wife and I spent the first four nights of our two week trip to Spain in this apartment. It was very clean and had all the amenities necessary for a comfortable stay. We especially enjoyed the balcony with its stunning views of the Bay of Biscay and the Zarautz beach. The property manager greeted us upon our arrival and made sure we had everything we needed for a nice stay. We enjoyed everything about the city of Zarautz. It is a great city for walking, both on the beautiful beach and on the tree-lined streets. It is an easy twenty minute drive to San Sebastian, and public transportation is also available. We would love to return to Basque country and stay in this wonderful place again. This apartment was awesome. It had everything we needed for our stay and is conveniently located between Bilbao and San Sebastian. The designated parking spot on the premise was a huge bonus. The location couldn't be better - less than 2 blocks to the beach and just a short walk to the eating/shopping area. We loved sitting out on the balcony where we had a great view of the sea! The apartment is perfect for a family of 4. It is clean, comfortable and quiet. It is located 100m from the beach, not far from the center of Zarautz. From the patio, the view to Getaria and the ocean is awesome and the patio is big enough to have meals and enjoy the view. Note that the patio can be closed by sliding-glass windows in cooler weather making it accessible all year-round which is a plus. Amaia and Aberri are welcoming and available when needed. We will not hesitate recommending this apartment and coming back ourselves. Estupendo apartamento para una familia de 2 adultos y 2 niños. Perfecta ubicación, muy cerca de la playa y comercios, farmacia, parque infantil etc. Apartamento muy cuidado y decorado con buen estilo. La plaza de parking viene muy bien porque aparcar en la calle por esa zona es muy complicado. Gracias a Aberri por el trato amable, profesional y cercano. Recomendable totalmente, para repetir. Very close to beach, great view from balcony, spacious living room with good equipment for cooking, free parking a life saver (even though it was a bit tough to park our huge VW bus in the crammed underground garage), comfy beds in bedroom and a lot of storage space.